Today is my son’s birthday. It also happens to be my birthday as well. When my wife first got pregnant and we did the calculations and determined that K would probably be a July baby, two thoughts went through my mind: oh no…having a summer bday is tough, & I really hope we don’t have bdays too close to each other. Cancer’s tend to be a bit self-centered and selfish…not always the best at sharing. And sharing a birthday was not something I was looking forward to at all. My own history with birthdays have been a bit negative. With a summer birthday, many times I could not celebrate it with my friends, either my family was traveling or they were on vacation; I could never bring in a cake or snacks to share in my elementary classroom; and, as a Cancer (notice I blame it on the sign and not myself) I might have a slight inclination towards being just ever so slightly mellow-dramatic and birthdays seems to be triggers for some unnecessary drama. Needless to say, I have been less an optimistic about sharing my birthday with K. Yet today, I had an excellent birthday and it was excellent cause my wife and I (with the great assistance of the grandparents) were able to cater completely to the desire of K and provided a birthday experience that we all enjoyed. 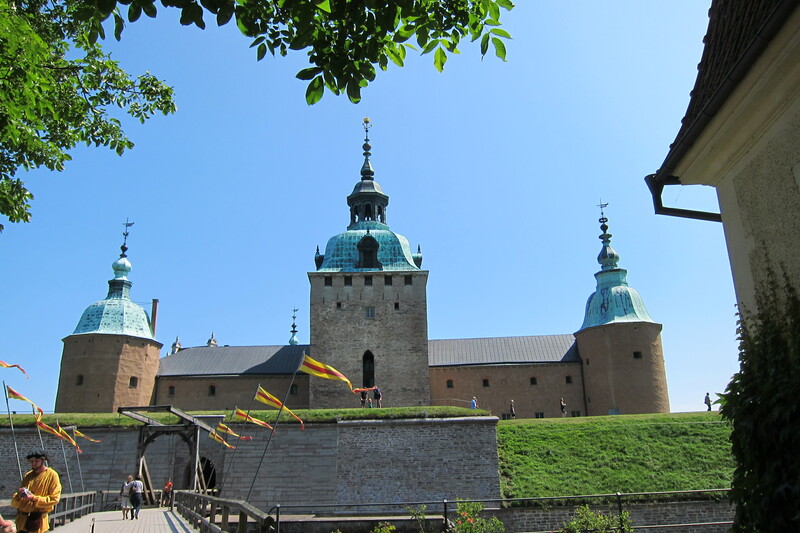 We went back to Kalmar Castle, which we visited for our first Christmas Fair back in December (click here to read that post). But instead of Christmas treats, we were in search of knightly experiences. 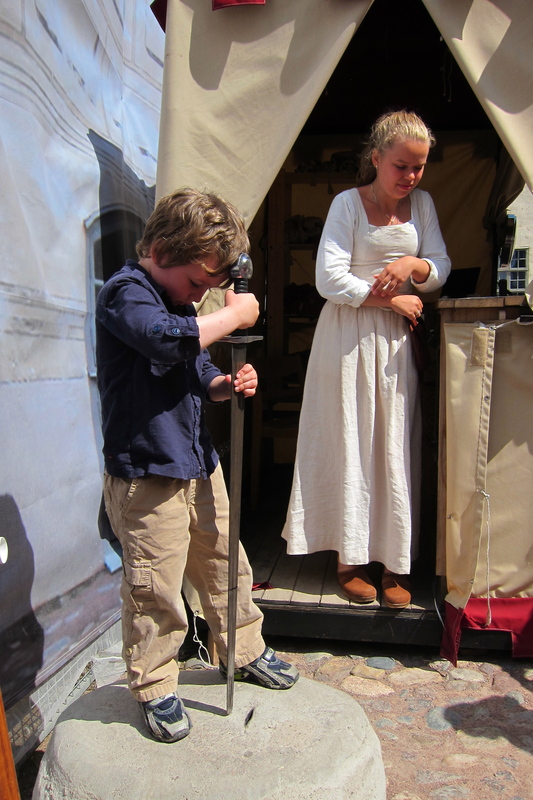 Kalmar Castle has a squire to knight program for those that are 7yrs and over. K is not that old yet, but we went and asked if something could be done for him. They immediately agreed, and set for K just one task (to pull a sword from a stone) and upon his success the Queen of the castle knighted K to become Sir K, Defender of the Realm and Barrier of the Castle Key. With that experience, an awesome wooden castle with knights and many knightly related books for gifts, and a delicious knightly decorated cake, K is still awake (way too late) playing out his Medieval fantasies…happy as can be. And I am just as happy seeing him so happy. I think I have realized that one of the aspects of my birthday that always unsettled me was that while I wanted to have a grand event for me, I was always uncomfortable with all of the attention on me. I am much better as a host caring for others than being fretted upon by others. Now my sharing my birthday with my son, I can enjoy elaborate events, but K gets to bask in the bulk of the attention. And one more reason why I’m alright sharing a birthday. When I finished helping K wash off his face after devouring the cake, I asked to a hug and kiss before he ran back to his room to see what turmoil beset his castle…K hugged me hard and very genuinely said, “Happy Birthday Daddy.” Even with all of the gifts and the cake and the attention focused on him, K still remembered that it was my birthday too. There is just something a little extra special in that. Previous Previous post: Blogging: It’s been a while.